BRITISH ROMANTIC WOMEN WRITERS: POETRY, 1770-1840 – RoWoPo Rules! In class we focused mostly on the finch poems and the whole idea of the bird in the cage for women. Women have been likened to songbirds, and caged birds constantly throughout literary history, and it’s not stopped. In Sweeney Todd: The Demon Barber of Fleet Street, there is an entire song for Joanna called Green Finch and Linnet Bird. In it, Joanna is sitting in her own cage, her room, singing while an actual caged bird is there singing as well just in case the audience didn’t get the parallel.The whole song, which is unlike in style to the others, just hammers home the fact that Joanna is a little singing songbird who needs someone to free her. Interestingly though, once she is free, she is not innocent and foolish. Anthony rescues her and she asks him “so we run away and all our dreams come true?” and when he answers that he hopes so she assures him nightmares never go away. She knows more about the world from her time in a cage than the idealistic Anthony. 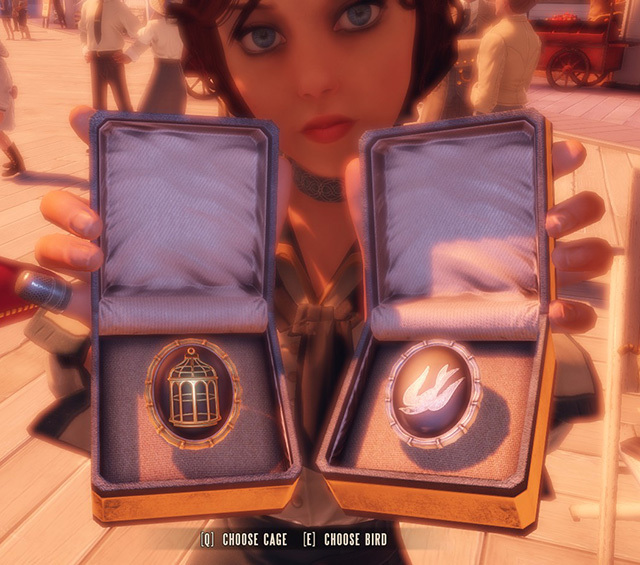 Another caged bird is Elizabeth Comstock from the game Bioshock Infinate. Like Joanna this metaphor is blatantly obvious and repeated. You meet the Lutece twins, omniscient people who live between the boundaries of space time (weird I know) and one of the choices they have you make is what broach to pick for Elizabeth’s neck ribbon, the bird or the cage. She is even called a songbird in game. Her father, the leader of the people of Columbia (where the came takes place also a floating city in the sky) locks her away for fear that “The False Shepherd,” your character Booker, will corrupt her and stop her from her purpose of destroying the world below by drowning it in fire. 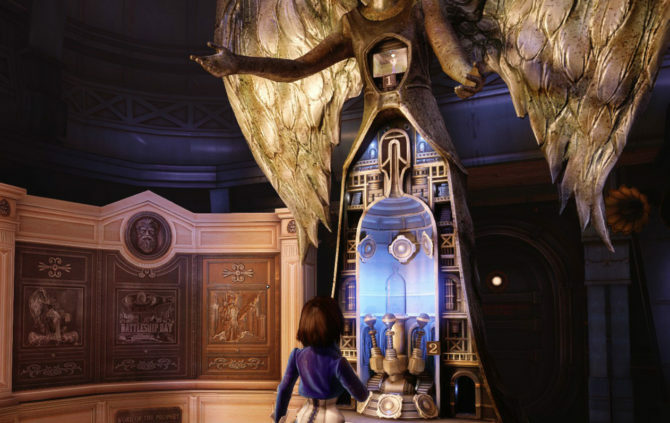 Her cage is a giant statue of an angel, but on the inside it has the shape of a cage. You even find a model of it eventually, pictured below. Like in the poems, the captor is her parent and repeatedly asks her to come back, to be protected assuring her that he wants what is best for her. After escaping, being beaten up and even killing someone, Elizabeth is horrified with herself at the moment but she still prefers it to going back. She even makes Booker promise to kill her to prevent them from taking her. The question of is it better to be safe and imprisoned or unhappy and free was also brought up in class, and these two more modern examples show that most prefer unhappy freedom than to live life safely locked away. The bird and the cage are still common themes in our narratives, but instead of the unsure argument the finch poems seemed to have, where some supported protecting the birds in cages and others advocated letting them go, the more contemporary narratives seem to all agree that freedom is better even if one the person is unhappy. Through the study of Romantic Era poetry, it is quickly learned that it is also often called “nature poetry.” Throughout the semester, the poets we have read have continually endowed the landscape around them with human life, passion, and expression. Nature, across all Romantic Era poets, is idealized as a place where the individual could find freedom from societal laws and standards, and, as seen most commonly in our RoWoPo authors, escape from life circumstances. Susan Evance, a poet included in Feldman’s anthology, provides an essential viewpoint of nature within the realm of the Romantic Era. Evance reveals nature’s influence and possible impact in the life of a speaker, specifically in how nature communicates with humanity in a number of different ways, and in turn, provides peace in the life of the nature observer. Susan Evance’s three sonnets, “Sonnet to the Melancholy” (242), “Sonnet Written in a Ruinous Alley” (243), and “Sonnet to a Violet” (243), should be added to the RoWoPo canon almost as an introduction to Romantic Era poetry because Evance writes about nature in a way that gives it voice and life, which predicates the significance of the communication between humanity and nature, and the value that nature brings to the lives of those who notice it. In the poem entitled “Sonnet to the Melancholy” (242), the speaker opens the reader’s eyes to what is happening in nature around her. The speaker talks about seeing the “wintry tempests” (line 1) while sitting upon a “lone rock” (line 2). She sees “sea-birds” (line 3) flying past her as the “roaring of the stormy wind” are “rushing thro’ the caves” (lines 4-5). In line 6, the speaker identifies these occurrences in nature as “the voices of those viewless forms.” In this poem, Evance clearly demonstrates nature’s ability and willingness to communicate with humanity through a number of different means. In lines 9-10, the speaker responds to nature with what she is feeling by saying, “Then, Melancholy! thy sweet power I feel, / For there thine influence reigns o’er all […]” This apostrophe directed towards the melancholy heightens the conversation occurring between nature and the speaker in a way that almost causes nature to become the melancholy that the speaker is feeling. As the speaker is sitting and experiencing the nature happening around her, the power and influence of the presence of nature grows as it maintains a deep effect on the speaker’s mood. Finally, in the last two lines, nature seems to have the power to take her away from the melancholy she is feeling – “My raptur’d spirit soars on wing sublime / Beyond the narrow bounds of space and time” (lines 13-14). The speaker is so captivated and moved by the nature around her that she is mentally and emotionally transported away from the melancholy. This communication between nature and the speaker is again depicted in the second poem entitled “Sonnet Written in a Ruinous Alley” (243). The “winds of evening moan” (line 4) and “loud the gust comes […] faintly murmurs” (lines 5-6) and “the owl begins her melancholy wail, / Filling with the shrieks the pauses of the breeze” (lines 7-8). Once again, Evance gives a voice to nature through many different means: specifically, the wind and an owl. The last stanza of this poem reveals nature’s ability to help the speaker escape from whatever she wishes to escape – nature “engage[s] my mind” (line 9), she “hear[s] their sadly-sweet, expressive song” (line 12) and the “visionary sound” (13) causes the “spells of rapture” to which “all my soul is bound!” (line 14). Once the speaker notices and listens to the nature around her, her soul experiences a moment of euphoria and she is perfectly at peace. Evance writes about nature in such a way that reveals that nature has value to offer to the world and its listeners. In this poem specifically, nature’s capacity to make itself known in the lives of those who listen to it is exemplified. Thus, nature gifts its listeners with euphoric and peaceful experiences. In both “Sonnet to the Melancholy” (242) and “Sonnet Written in a Ruinous Alley” (243), it is interesting that the words “forms” and “rapture” are both used because this is key in understanding Evance’s beliefs about the influence and power of nature. The speakers in these two poems both experience “forms” by which they are ultimately “ratur’d.” In “Sonnet to the Melancholy,” the speaker experiences “viewless forms” (line 6) and in “Sonnet Written in a Ruinous Alley” the speaker sees “forms which not to earth belong” (line 10). These forms are the elements that the speaker is seeing, hearing, learning, feeling, and experiencing in the nature around her. The forms “rapture” her soul and spirit – they captivate her, produce euphoria, or carry her to another place or sphere of existence. Evance shares with her readers the power that nature has to not only communicate with whomever is around it, but also to take a person’s soul to another realm of reality in which they experience happiness or peace. In the final poem, “Sonnet to a Violet” (243), Evance implores her readers to pay attention to nature because of its valuable offerings to the world. The poem tells the story of a violet that has tremendous beauty, one that shows the “rosy tints of morn” (line 4) who’s “velvet form” is “beautiful to view” (line 5). This sight of the violet then causes the speaker to wonder about all the other violets that grow where no one sees, where “foot-step never trod” (line 10). The speaker describes these undiscovered violets as “Unadmir’d, unnotic’d” (line 11) and are “unseen” (line 10) before they “die neglected” (line 14). In this poem, Evance writes about an opposing experience of when nature is ignored or neglected instead of appreciated and noticed. The speaker does not notice the beauty and value of nature, and therefore does not have a moment of ecstasy or peace. There is no connection or communication with nature, therefore, the speaker misses the valuable encounter that nature offers. Evance calls the violets “flowers of genius” (line 13), signifying that nature has this power to instill peace and “rapture” those that observe and internalize it. Susan Evance’s three sonnets, “Sonnet to the Melancholy” (242), “Sonnet Written in a Ruinous Alley” (243), and “Sonnet to a Violet” (243) all provide an important introductory view of nature for our understanding of “nature poetry” in the Romantic Era. Evance writes about nature as a communicator – one that connects and relates to its viewers and listeners. In “Sonnet to the Melancholy” and “Sonnet Written in a Ruinous Alley,” the way that Evance gives voice and life to nature causes the speakers of the poem to experience a euphoric and peaceful moment apart from the reality of life they are currently experiencing. In “Sonnet to a Violet,” Evance offers the perspective of life without nature – a speaker that does not notice or appreciate nature, and therefore, does not experience ecstasy or peace that nature predicates. In these three poems, Evance establishes the essentiality of nature in the overall experience of life – that with it, nature offers peace, contentment, and elation that is contingent upon internalizing and noticing it. I still don’t know how to put this in the right spot. UMW Blogs is hard. The man is the head, but the woman is the neck.